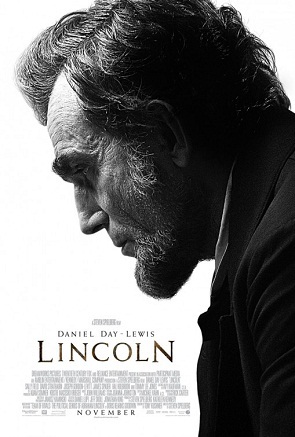 So I just got back from viewing the recent Steven Spielberg movie- Lincoln staring Daniel Day Lewis and Sally Ford as the Lincolns. My feelings are decidedly mixed on the movie. To begin with it is a very well made movie. The costumes, sets, lighting, and cinematography are all first rate. It also goes without saying that Daniel Day Lewis was amazing as the President. I also loved Tommy Lee Jones as Thaddeus Stevens, who is a fascinating character of the time to study. David Strathaim was also excellent as Secretary of State William Seward. What didn’t work for me was Sally Field’s performance as Mary Todd Lincoln. I’m sorry but she looked old and haggard. I just didn’t buy her as the elitist slightly nutty first lady. I also thought the subplot with Joseph Gordon Leavitt as Lincoln’s son Robert was unnecessary and distracting. There were too many moments like that in Lincoln where storylines were scattered all over the place. It honestly would have been better as a mini-series rather than a movie. In that format time would have been given to fully develop all of the characters introduced. As it is you get to meet a dizzying number of congressman, General Grant, all of Lincoln’s cabinet, a Southern delegation coming for supposed peace, General Lee is seen briefly, 2 men are hired by Lincoln to drum up votes, Hal Holbrook plays influential republican Francis Blair and I could go on. It is too much and the story tries to pull you through it all and it ends up dragging. What needed to happen is for the script to be tighter with a real narrative of a building, climax and ending. As it is, at times it felt more like a viewing of the Hall of Presidents. All interesting, but no real story to draw you into the history- no narrative arc to keep you engaged. If it had stuck to the incidents of 13th amendment and more briefly discussed some of the other factors I think it would have been more compelling and easier to follow. It ends up feeling more like a text book than a story. It also has some Spielbergian features in the film such as the wide panning shots and the towering music by John Williams. He loves turning moments that shouldn’t be dramatic into high emotion and then there are so many of those moments that you don’t know when the top moment has come and you are supposed to be the most excited. When the 13th amendment is passed you want to stand up and cheer but I think I could have cheered more loudly if I had not already been wrung out by Spielberg and especially Williams music. That said, I did learn a lot about the passage of the 13th amendment that I’m grateful for. Lincoln was a master leader. Someone that people either loved or hated and don’t all good leaders inspire one or the other? He listened but also led with a decisiveness I find impressive and which I’m sure was especially needed during a time of Civil War. A time when compromising had led to so much bloodshed. Daniel Day Lewis plays Lincoln as a thoughtful, endearing, quiet, even funny man who looks weary from the weight of trying to do the right thing. I think the actual Lincoln is probably more complicated in his positions than Spielberg would allow us to see but it is not the grand, perfect pontificator you see in some movies. He even slaps his son in frustration at one point. It is a great performance and worthy of seeing the movie just for it alone. I also appreciated that it did not try to translate the story to modern issues of the day such as was done in the obnoxious 2010 movie The Conspirator, which told the story of Mary Surratt, the only women executed for the assassination of Lincoln. That movie rammed home the message of political prisoners and the analogies of Guantanamo Bay so loud it drove me crazy. It also suffered from a script that dragged and got too bogged down in historical detail and legal explanations. I don’t need to be lectured to when I go to see a movie. I just want a good STORY! So, in the end I have mixed feelings about Lincoln. Go see it for the acting and to learn something about history but just know it is slow in portions and could have either been longer or shorter. As it is, the story drags and the multitude of characters is a bit overwhelming. Still worthy of a rental for sure. I’d give it 3 stars. I think it needed a tighter script with about 20 minutes cut out! Agreed. Too many subplots. Too many characters.